Scribo Displays also offer forecourt signs with high strength ACM back panel that are suitable for use with dry-wipe and liquid chalk pens. 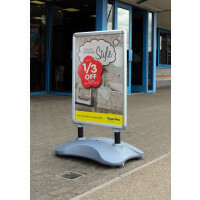 These forecourt signs also have front-opening aluminum snapframes that facilitate the easy replacement of posters. Our forecourt signs are available in three sizes and have water-fillable HDPE bases and heavy duty mounts that ensure stability by allowing panel deflection in the wind. The anti-glare PET poster covers that we offer with these signs ensure the safety of the display posters in the frames. The soft round corners of our forecourt signs help ensure the safety of the users of these forecourt signs. We look forward to assisting you with the selection of the most suitable forecourt signs for promoting your business.